Syd flies planes, writes novels and looks like a model! Not only is she talented and beautiful, but she has the voice of an angel, a great sense of humor and when she's not writing, she's inspiring and motivating young pilots. Syd's story began at nine years old. Which appears to be an inspiring age for girls. She began writing in the back of her father's Mooney. To grandmothers house they flew--- her dad, three older brothers, and Syd tucked away in the baggage compartment with pen and paper. From this hideaway her first story emerged---Diamonds Till Dawn. A story about kids who were trapped in a museum overnight with a mummy on the loose. The museum sold diamonds and other polished rocks for 10 cents. I'm liking this story Syd. Revise. Revise. Happy Birthday! 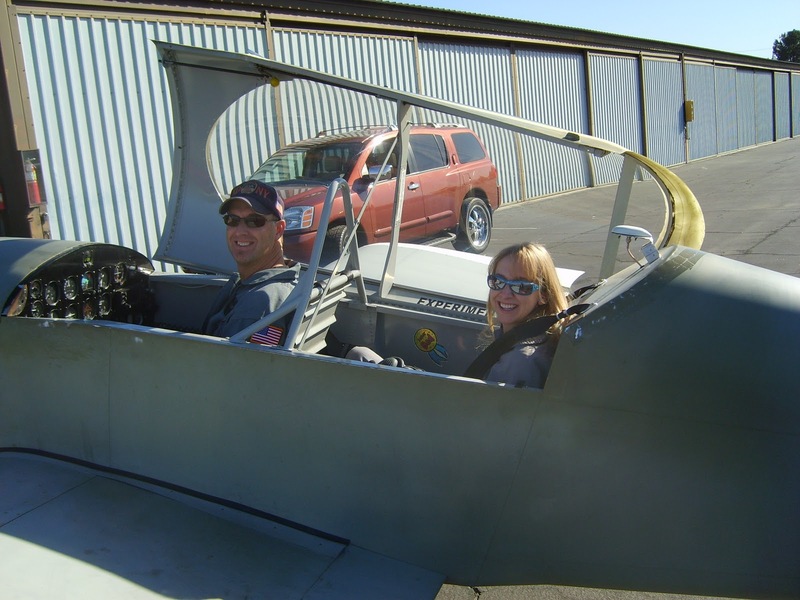 Syd took her first flying lesson on her 14th birthday, and the sky opened to another world. They let her out of the baggage compartment and she soared. And once she took the yoke from her brothers, she had more fun flying to grandmas. Despite the new passion of flight, the writing never stopped. Dad had spent endless hours sharing his stories from the Air Force and "the good ol' days" at the beginning of the jet age--- He also taught all the kids how to fly. She says her dad is, "The biggest flying enthusiast on the planet!" Now Syd flies. She writes stories. I'm thinking dad made an impression on this young lady. Syd didn't grow up in the shadow of her dad and older brothers, she bloomed under the banner of men she calls family. Her brothers all happen to became professional pilots, too. One brother is a pilot for a major airline, one is an aerial firefighter, and the eldest brother is just a private pilot who happens to be a rocket scientist--- "launching who-knows-what into orbit." Please tell us more! "Sorry, that's classified." I know they are all proud of her. The year 2002, and Syd moved to Big Bear Lake because her husband's business "thrived in the mountain community" and she didn't want to uproot him. Besides, she loved the forest, hiking and the beauty. She could have it all. But to avoid a two hour commute to work, she decided to get her certificates and fly, cutting the commute to 20-minutes. Six years later Syd gave up the "day job" and began flying professionally. 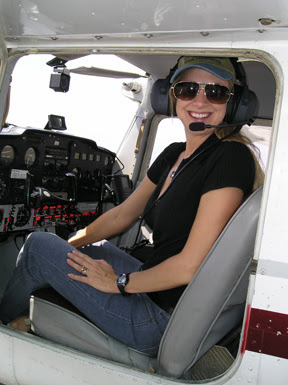 She covers the southwest with her aviation business that specializes in surveillance. But her real passion is writing--- She loves it "more than flying." Talented--- she's produced, written, and edited professionally for TV stations, production companies, book publishers, websites and magazines. My fellow Critique Sisters and I had the great opportunity to meet Syd at the SDSU Writers' conference last weekend. Syd was in town pitching her YA novel Live Large or Die Small. Syd is living large, and her novel is going to be a National Best Seller. Syd received so many questions from kids, she also produced a DVD to answer them all. Check out a taste of Life in the Skies. At the bottom of this page-- learn how you can win a free copy! "With so many kids telling me they were dying to fly, I felt compelled to tell them about all the great resources. Young Eagles is an awesome program giving kids free flights, and AOPA and WAI have mentor programs. Pilots love to pass on their passion for flying, but I sees it as a course in self-empowerment that should be required learning. I wish everyone could learn to fly. The boost to self-esteem is worth it alone. It’s an amazing journey to become a pilot, and it changes your viewpoint forever. Kids write me saying things like, “I want to fly so bad but my parents say I’m not smart enough.” Or “I heard it’s hard to fly.” I tell them, “It may be hard to learn to fly, but easy is sitting on the couch and I bet you want more from life than sitting on the couch.” It’s too bad there are so many who want to discourage new pilots. I’m working to encourage everyone interested just because of the personal benefits. The solo is an awesome right of passage. It’s so incredible that we can fly. Why not do it?" "Whether the goal is personal accomplishment, sheer joy or a career in the sky, I say give it a try. I often hear pilots say they had to go for this career, whatever challenges they faced, because they love it. You’ll never know if you love flying until you try your hand at the yoke." Syd is an amazing women. I can hardly wait until we can give a copy of her book away too. But today, I'm running a drawing and giving one FREE copy of to one lucky winner. Leave a comment to Syd about why you would love a copy of this DVD. Keep your fingers crossed, you could be the winner. Drawing announced on February 28th. Syd, Thank you for sharing your story and being such a huge inspiration. Come to Seattle in August to the PNWA conference and hang out with your new friends. What an excellent choice for your Friday Flyer! I'm so happy I had the chance to meet Syd in San Diego this last weekend. She is an amazing lady with a giving spirit. She really does it all, doesn't she?! :) Great story! Syd is awesome. Anyone who is so sweet, can fly a plane, tell a story, and wear those high heels all last weekend in San Diego gets my vote! It was good to meet you, Syd. Great post, Karlene. Gr8 Story ; especially the baggage compartment... More than the DVD, I can't wait for the book! Syd has exemplified how learning to fly can shape your life on the ground as much as in the air!! Heather, It was great to meet her! And she writes your genre. Too fun! Victoria... yes a great story! Just as yours was. Keep flying!!! Hi T.J. Isn't that the truth. We've all been shaped somehow by the events of our life. And then we make a choice to go for it, or not. I too want the book! I watched her video on Youtube.And I do want to watch all of her talking,not 2 minutes 37 seconds...Because my dream is PILOT what she said on Youtube and I am thinking I should need about this as she said. I can see that she is talking with joy and I am sure I can learn enjoyable. Thanks for sharing this topic Karlene san. I am really really looking forward to flying and becoming airline pilot:) Never give up. Great Jun, You are entered into the contest too! I know you will fly... you already are! Masaud, I will enter you in the contest too! Good luck!